In California's Livermore Valley, about an hour east of San Francisco, some 5,000 cases of Wente Vineyards wine are waiting in a warehouse, their journey to China suddenly suspended. The bottles have been caught up in a larger trade dispute, in which the US and China have exchanged threats to impose tariffs on billions of dollars worth of products, including American wine. Wine might seem like a bit player in the fight, which revolves around American concerns about Chinese state subsidies and rules they say pressure US technology firms and car-makers to hand over intellectual property. But as the two countries settle down to negotiate, the industry offers a glimpse of what's at stake in the confrontation, which has led to unease on financial markets and prompted warnings of a trade war. "It's a wait-and-see game right now," says Michael Parr, vice president of international sales for Wente Family Estates, which counts China as one of its top 10 markets and put its shipment on hold as the tariff talk flared. American officials have downplayed the dangers of retaliation to the US economy. But China, which included wine on a list of 128 products worth $3bn targeted for potential tariffs, is confident that its growing market power, fuelled by a rising middle class, will give America pause. That's true even when it comes to wine, which represents a tiny fraction of the trade between the two countries. Exports represent only 5% of overall US wine sales. And only about 5% of wine exports, some $79m, are destined for China. Wine-makers are worried about tariffs anyway. They say even if they can afford to lose business in China now, the country is critical to the industry's future. "We're not in a position to lose market share," Mr Parr says. When Mr Parr started in the business in China in 1994, working for the country's first importer of foreign wine, most products were aimed at expats and foreign businessmen. But Chinese tastes have changed. Wine consumption in China has increased almost five-fold since 2000, with imports surging from 1% to about a third of the market, says Chuan Zhou, a research director at UK-based Wine Intelligence. Interest in wine is also helping to drive tourism, making China the biggest source of foreign visitors to Napa Valley in 2016. China is the Napa Valley Wine Train's third largest international market; at the Beringer and Sterling vineyards in California, 20% of tours purchased are in Mandarin. Wente, a family-owned vineyard that produces roughly 700,000 cases of wine a year and exports about a fifth, has benefited from the surge in demand, with exports to China rising 80% this year before the talk of tariffs. "It's one of the top [markets] in terms of growth rates and growth potential," Mr Parr says. In some ways, American wines are playing catch-up in China, where French wines have long dominated. US bottles account for less than 5% of foreign wine sales, their appeal hurt in part by high prices tied to hefty fees China levies on most alcohol imports. Australia and Chile signed free trade deals with China in recent years to reduce those taxes, helping their sales. Ridge Vineyards, which got a boost in China after one of its wines was served at a 2013 dinner hosted by President Barack Obama for President Xi Jinping, says the proposed 15% tariff would raise prices further, putting American firms at another disadvantage. "We were already fighting an uphill battle in a way, and now if you tag an additional 15% on top of that .... 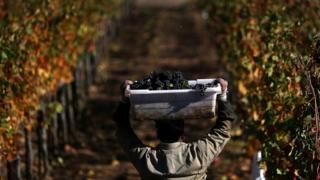 I don't see how this doesn't have an impact on our business," says David Amadia, the vineyard's president. The California Wine Institute, which represents about 1,000 vineyards and wineries in the US, has been pushing to raise the profile of California wines, spending on social media campaigns in China, trade missions and offering master classes. The organisation, which argues the White House should support wine exports, says a new 15% tax could be "catastrophic" to its efforts to make inroads in the market. "Something like an additional 15% in tariffs could really knock the feet out from under us," says Linsey Gallagher, the institute's vice president of international marketing. Despite the concerns about the future, analysts expect the economic damage to be limited in the short-term. Inside China, tariffs would likely mean higher prices. But Jim Boyce, a Beijing-based wine consultant who writes on the Grape Wall of China blog, says American brands are likely to be able to hold onto many of their customers, who were already prepared to spend more. "Of course, no tariff is better than a tariff, but the impact isn't nearly as bad as it would be for some," he says. If demand in China does slip, many wine-makers say they are confident they will find buyers for those bottles in other markets. The volumes are small enough that no change in prices is expected. If the damage is limited, what is the point of the threat? Gary Hufbauer, a non-resident senior fellow at the Peterson Institute for International Economics, says the threat of tariffs reminds the US that China is willing to retaliate - and has kept its options open when it comes to bigger items such as aircraft. But he says China's list of targeted items, filled with high-profile products like wine, is intended to inflict political rather than economic pain, creating the conditions for a compromise. The wine industry - and many others - have their fingers crossed.